Engineers connected SpaceX's Dragon spacecraft to its Falcon 9 launcher Thursday, setting the stage for a busy weekend of preparations for a brief firing of the rocket's nine main engines on the launch pad Monday. The Falcon 9 rocket's Merlin 1C first stage engines will fire for about two seconds in a standard pre-launch test of the fully assembled rocket before liftoff. The hotfire is scheduled for the conclusion of a practice countdown at 3 p.m. EDT (1900 GMT) on launch pad 40 at Cape Canaveral Air Force Station, Fla. SpaceX plans to webcast the event starting at 2:30 p.m. EDT. "During the rehearsal, SpaceX engineers will run through all countdown processes as though it were launch day," the company said in a statement. "The exercise will end with all nine engines firing at full power for two seconds." The engines will generate more than 800,000 pounds of thrust, and four hydraulic swing arms will hold the launcher on the pad during the hotfire test. Controllers will load kerosene and liquid oxygen propellant into the Falcon 9's two stages during the countdown rehearsal. The engines are fired before being shipped to Cape Canaveral at SpaceX's test site in Central Texas, but the on-pad ignition verifies the rocket is in good shape for launch after being bolted together inside a hangar. 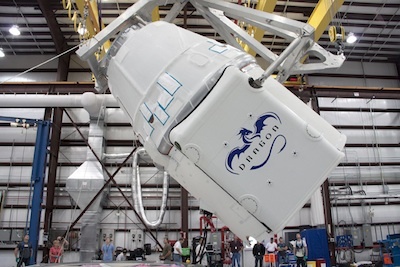 Workers attached the Dragon spacecraft to the Falcon 9's second stage Thursday, and plans called for the addition of the Dragon's aerodynamic nose cone over the ship's docking system Friday. SpaceX also filled the Dragon capsule with hypergolic maneuvering propellant this week. SpaceX will roll the Falcon 9 rocket from its hangar to the launch pad Sunday and lift the booster upright with hydraulic pistons on a transporter-erector device. The transporter-erector serves as an interface between the rocket and ground supplies, including propellant, pressurant, communications and electrical systems. "After the test, SpaceX will conduct a thorough review of all data as engineers make final preparations for the upcoming launch, currently targeted for May 7," SpaceX said in a statement. Liftoff on May 7 is set for 9:38 a.m. EDT (1338 GMT) during an instantaneous launch opportunity. A backup launch date is available May 10. If the Dragon blasts off May 7, it will reach the International Space Station on May 9 for a flyby 1.6 miles below the complex. The test approach will check the craft's guidance, navigation and control systems before NASA allows the vehicle to come closer to the space station. 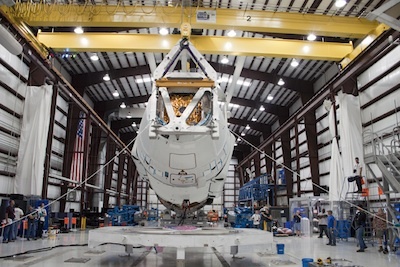 If all goes according to plan, the Dragon will be in position to rendezvous with the space station again May 10 for berthing with the orbiting lab. The Dragon spacecraft is flying on a demonstration mission for NASA. The space agency and SpaceX plan to begin operational cargo deliveries to the space station later this year if the test flight goes well.